Oh, I'm afraid he's gonna get that love, too - and I'm gonna have a very hard time watching it! If Frank gets more intimate time with Claire next season than we saw Jamie get this season, my TV screen probably won't survive whatever I end up throwing at it. Take a deep breath and get a grip. 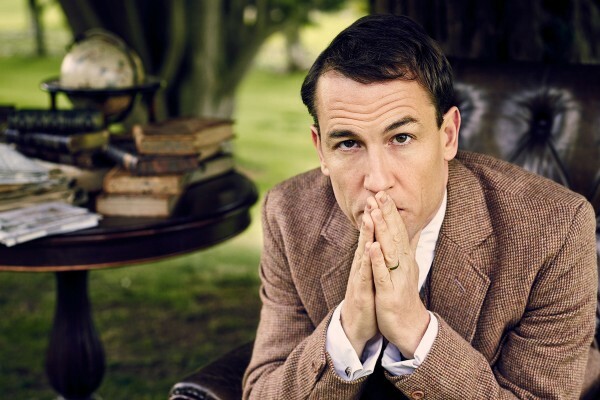 Once again we are conflating the charm and acting skills of Tobias Menzies with ONE of the characters he plays (anyone feeling sympathy/nostalgia for Black Jack Randall needs in-patient psychiatric care). I refer you to the source material: "Voyager," chapter 19, in which 1) Claire recalls that Frank Randall cheated on her while they were in Boston with at least a dozen women before Bree started her last semester in high school and 2) Frank - in his own voice - tells Claire of his imminent plan to take Bree away from her and move back to England; admits to being relentlessly unfaithful to Claire (although he seems surprised to discover that Claire's known it for years); and outs himself as a virulent racist, worthy of the KKK. This is the Frank Randall those attempts at "adaptation" are trying to whitewash. There's no redeeming that shite. Nevertheless, we'll undoubtedly get scene after scene of supposed "domestic bliss" between Claire, Frank, and Bree in the wasteland 20 years of the Claire - Jamie separation, thus giving Tobias ample chance to make one last try for that elusive Emmy nomination as the noble, long-suffering cuckolded husband (gag me), while Claire stares wistfully off into her lost past with the Guy In the Kilt. So there's that. On the Jamie side of the 20 years, we can look forward to the rehabilitation of Leghair (which already began in the "Fox's Lair" episode), since we know Jamie's gonna marry the little monster he KNOWS tried to have Claire killed (still can't get my mind around THAT). The brilliant minds at the Outlander TV Show are going to try to make us swallow the idea of true love between Jamie and 1) Leery AND/OR 2)Geneva Dunsenay (that's the little witch who blackmails Jamie into a night with her, gets knocked up with Jamie's son William, and then conveniently dies in childbirth -- rumor has it that Sam Heughan's latest squeeze has been cast in THAT part). Doubtful any of the actresses connected with Jamie will have days of the week named for them like Tobias Tuesdays, though. Whatever you may feel for Tobias, remember that none of these characters is worthy of much sympathy. It was Jamie and Claire that got us into Outlander; and that's where our focus should stay. Wow, I'm anticipating a lot of disappointed "fans" when season 3 shows Frank as the decent guy who did the best he could under very difficult circumstances - just as Diana wrote him. Problem is, a lot of readers, in their haste to get to the all of the juicy J&C bits apparently skipped or skimmed over the "boring" Frank bits, so they only got half the story. Ya'all can go debate it with Diana over on CompuServ if you like, but fair warning, you will lose. For sure, Carol. Wind of All Hallows gives you much better insight into Frank as he's portrayed at the start of Outlander. Claire tells us right there in black and white why he is so wrapped up in his genealogy, but I think that went right over most people's heads. Poor guy!